From age four to seven months, the most important changes take place within your child. This is the period when he’ll learn to coordinate his emerging perceptive abilities (the use of senses like vision, touch, and hearing) and his increasing motor abilities to develop skills like grasping, rolling over, sitting up, and possibly even crawling. Here are some other milestones to look for. Sitting becomes a favorite pastime for babies in their seventh month. Most babies can now sit unsupported—although consider keeping those cushions nearby in case she topples! When your child sees an interesting object out of reach, she may try to get it. Lunging forward from a sitting position is a very important movement. In time, as she continues lunging, she may pivot up onto her knees for an extra long stretch. She’ll learn that she can hold herself up on all fours. She may rock back and forth with this new position, practicing for the next big movement: crawling. Crawling in itself is not a milestone: Seeing an out-of-reach object and figuring out how to get it is a milestone. Some babies creep on their bellies, some crawl, others scoot on their bottoms. Some babies skip this stage altogether and start pulling up to a stand and walking. But your baby is probably very content right now to sit and observe the interesting sights around her. Enjoy this time, because she will soon be in constant motion. 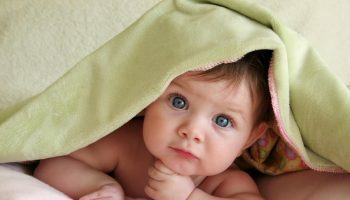 Sometime between month six and 12, your baby may show the first signs of being wary of strangers. She can now clearly distinguish between people she knows and people she doesn’t. It is a normal phase and affects children in varying degrees. You play a very important role in helping her deal with strangers. First, you never have to apologize to anyone for her reactions. Her response is not an indicator of insecurity or a reflection of your parenting skills. Instead, talk to your baby about the stranger: “This is your Uncle Peter. He has heard a lot about you. He looks very happy to meet you.” Your baby will accept the stranger must faster if she can feel your own acceptance. If you like this person, then maybe he is safe. Identifying an ideal weight for a 7-month-old usually means identifying a desirable range. 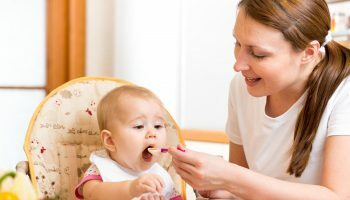 According to KidsHealth, babies come in many different shapes and sizes, and if your baby is in the 5th percentile for weight, that does not mean she is any less healthy than a baby in the 50th or 95th percentile. What is important is that she follow the same pattern of growth. 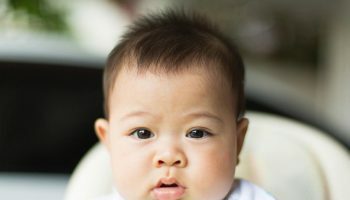 For example, a baby girl who is born in the 50th percentile and jumps up to the 60th percentile at her 1-month well-baby checkup ideally would be around the 60th percentile at following checkups. During the first six months of life, an infant gains about 1.5 to 2 pounds a month, according to KidsHealth. At around 6 months, the weight gain can slow to 1 to 1.25 pounds a month. An average 7-pound newborn could weigh about 17 to 18 pounds at the end of the seventh month, according to KidsGrowth. The 50th percentile weight at 7 months is 17 pounds for a girl and 18.5 pounds for a boy. Encourage curiosity through playing games. Ideas to help promote motor, sensory, communication and feeding development are listed below. Put a toy or book inside an empty cardboard box. Wrap it with colorful paper or newspaper comics. Clap your hands when baby yanks it open then announce what is inside.